Mothernode customers that have many users within their organization will want to reduce the total number of users who may be assigned to certain transactions or customer accounts. By default, all users appear in selection lists, but Mothernode Administrators can customize these list to only include relevant users in the selection. For example, larger organizations will want to limit the number of users that may be assigned to quotes or contact accounts to sale reps or account managers. Administrators can customize user lists for the following module. When access modules or transactions that can be assigned to users, Administrators can customize the user list for each module following these steps. Click the gear icon next to the list. 2. Select the users you want to include in the list and click SAVE. 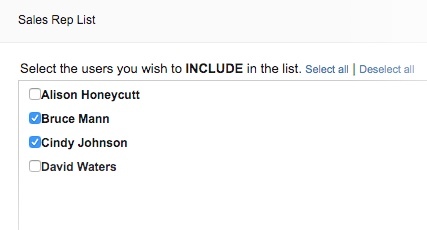 Only the selected users will appear in the list.